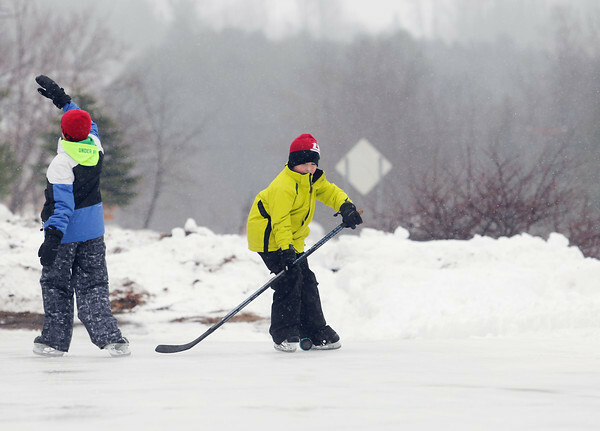 Owen Corwin, 10, of Honor, skates with others Saturday on the Homestead Ice Rink in Honor Saturday during an ice skating party. The rink was built in cooperation with Homestead Township, Homestead Township Fire Department, Jack Rineer, the man responsible for building the Benzonia ice rink, and local contractors. "It's much smoother than I thought it would be," Owen Corwin, 10, of Honor, said. "It's really fun, I've been wanting to go skating for a while," Michael Wooten, 10, of Honor, said.